You've found the “U.S. 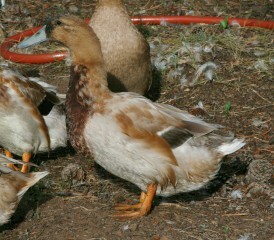 Golden Cascade Duck Breeders” page here at Hobby Farm Wisdom! If this is the first time you have visited our site: Welcome! Golden Cascade Ducks derive their name from their golden hue and from the popular Cascade Range of the Northwest America. They weigh between 6-8 pounds. Females have fawn or buff plumage and orange beaks with brown markings while the drakes have yellow beaks, satin green or bronze heads, a white ring on their necks, reddish breasts and white underbodies. The Golden Cascade ducks lay their eggs from January through August, take some few weeks off and then start again until the beginning of the brooding season. The spring ducklings will start laying at the start of fall. These ducks live 4 to 8 years and can live up to 12 years, depending on the breed. Golden Cascade Ducks are omnivores so they eat food of both animal and plant and origin. A special feature that the Golden Cascade Duck has is its water-proof feathers, even when the duck dives underwater, its downy under-layer of feathers will stay totally 100% dry.